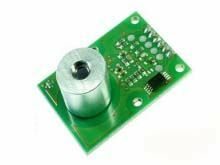 The TSEV01S01C10 is a contact-less temperature measuring system for OEM use based on the detection of infrared radiation. The TSEV01S01C10 is equipped with an infrared sensor (Thermopile) in front. The Thermopile Sensor has to be pointed at the target object.